I’ve been looking forward to today, because today I’m going to cross over the River Severn and walk into Wales. It will be another important milestone in my coastal trek. My hubby drops me off at Severn Beach. We have his mother with us and I set the timer on my camera to take a snap of the three of us, with the Second Severn Bridge as a backdrop. I begin walking and soon reach the bridge. This is where the M4 motorway leaves the shore of England and heads over the water towards Wales. I always love the moment when I walk under the huge arch of a massive bridge and can look up at its exposed underbelly. And, because this bridge has a gentle curve, I can even take a photograph of the central suspension section through the gap between two of its supporting pillars. There is no pedestrian access over the M4 crossing, and so I’m heading a little further up the river. It’s only three miles to the old Severn Road Bridge, where the M48 crosses over, and this bridge carries a footpath and cycle track along with the motorway. Out in the Severn the tide is low. Plenty of mud showing. I pass a sign marking the old ferry crossing, and the site of the old railway bridge, now replaced by the Severn Tunnel. The bridge crossing will be a long one – two and a half miles in total – and I would really like the sun to be shining. It rained overnight and the morning is dull with low clouds hanging overhead. But the BBC forecast has promised sunny spells. I’m in no hurry and linger taking photographs, passing the time, hoping the weather will continue to improve. And I’m pleased when I see a patch of blue sky appearing over Wales. A good omen. I turn away from the new bridge and walk onwards. The old Severn Bridge is harder to photograph. It’s pillars are white, not grey, and less obvious against the light of the sky. Ugly pylons on either side dominate the view, taller than the suspension pillars of the bridge and sending their wires to compete with the lines of the suspension cables. Also, from this angle, the horizontal arch of the bridge becomes lost in the blue horizon of the low hills beyond. Disappointing. I hope for a better view further along. But first I have to cross a field of cows! 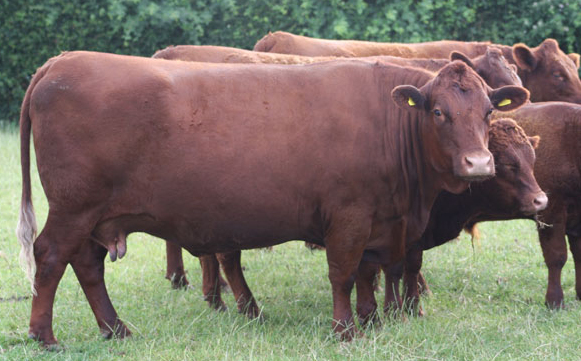 I had begun to feel braver around cattle, but my frightening experience on the bank of the River Yeo has rattled my confidence. I give these cows a wide berth, and am very grateful when they ignore me. Beyond the fields my path joins a quiet lane, lined with parked cars. I wonder what all the people are doing here, as I have only met a few bird watchers so far, and there is nothing around. Until I realise the drivers – mainly men – are all sitting in their cars. Asleep. What a strange thing to do on a Sunday morning! Perhaps they’re all avoiding helping with the roast dinners at home. I walk up the lane, towards a small collection of houses. This is Old Passage. I can no longer see the bridge. When I stop to ask a man if I am on the right road, he tells me the bridge is still a long way off. And it’s a long walk across. Disappointed, I realise that, despite my walking trousers, well-worn boots and battered rucksack, I still don’t look like a proper walker! A mile or so of road walking, and I find the beginning of the cycle route. Ahead I can see the tall lights of the motorway toll area. But still no view of the bridge. I remember reading about the motorway service station, called the Severn View. It’s on the north side of the road, but you can get to it, according to someone’s blog, by crossing over the motorway via a gantry above the toll booths. My plan was to stop for a coffee at the service station, but I’m not thirsty and the sun has come out. So, I decide to hurry on and get to the bridge while the light is bright. But I can’t resist finding the path that leads to the gantry above the toll booths. Yes, you can walk or cycle over here. And there is a great view looking up the motorway to the towers of the bridge. Onwards, and I return to the south side of the gantry, following the path as it joins the motorway just before the start of the bridge. I see a jogger running through the gate and realise the route can be closed to deny access – perhaps in bad weather or in case of an accident. But the weather is great for walking today. Sunny spells. Not too hot. And not a breath of wind. I check my watch. It’s 12:13pm. My plan is to find a pub in Chepstow for lunch but, in the meantime, I’m in no hurry to rush this crossing. I step through the gateway and begin my walk. Over the bridge. To Wales. The light along the river is far from perfect – hazy in the distance and blinding reflections from the water. But the view is still amazing. And it is good to look back the way I’ve come and trace my route along the bank. The walk/cycle track is remarkably clear of the usual visual litter that many authorities feel obliged to plaster on every available post. But I do pass a couple of signs. 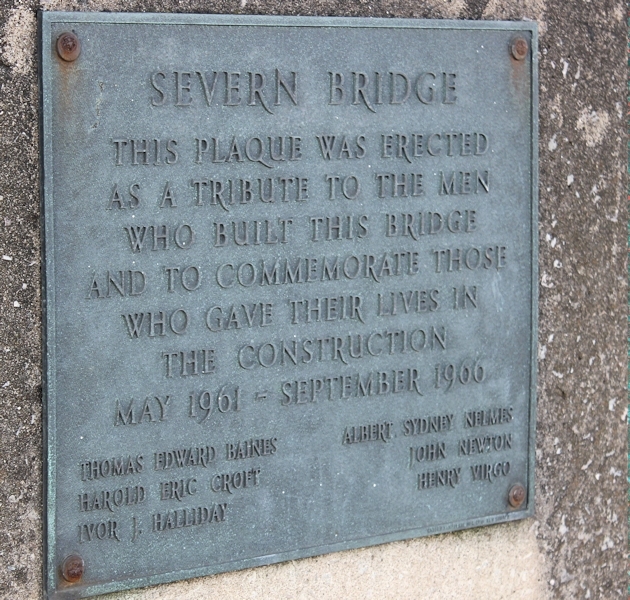 There is a plaque commemorating the men who lost their lives during the construction of the bridge. And a few warning signs to deter me from trying to climb the support cables. There is something surreal about walking so close to motorway traffic. After a while I realise you can also walk/cycle along a second track that runs parallel to this one but along the opposite side of the motorway. I wonder what views I am missing over there? For a wild moment I consider finishing my walk along this side, crossing the road, and returning back on the other. Just to properly experience this bridge. But I’ll never make progress along the coast if I keep re-crossing bridges! The traffic is light, most cars and lorries seeming to prefer the M4 over the Second Crossing, possibly because it takes you closer to Swansea and Cardiff. It’s just as well. Whenever a lorry thunders past, the whole structure vibrates. As I approach the central suspension part of the bridge, a group of cyclists whizz past. They are all dressed in green tops. Some sort of riding club, I suppose. Apart from brief flurries of cyclists, most of the time the pathway is empty. I only meet the occasional walkers: couples walking over from Wales. From the central portion of the bridge there are some great views back down the river to the Second Severn Crossing. I wonder what it would be like to walk over that bridge. It seems longer than this one. Shame it’s closed to pedestrians. I am still nowhere near the end of my bridge, which begins to pass over a spit of land. 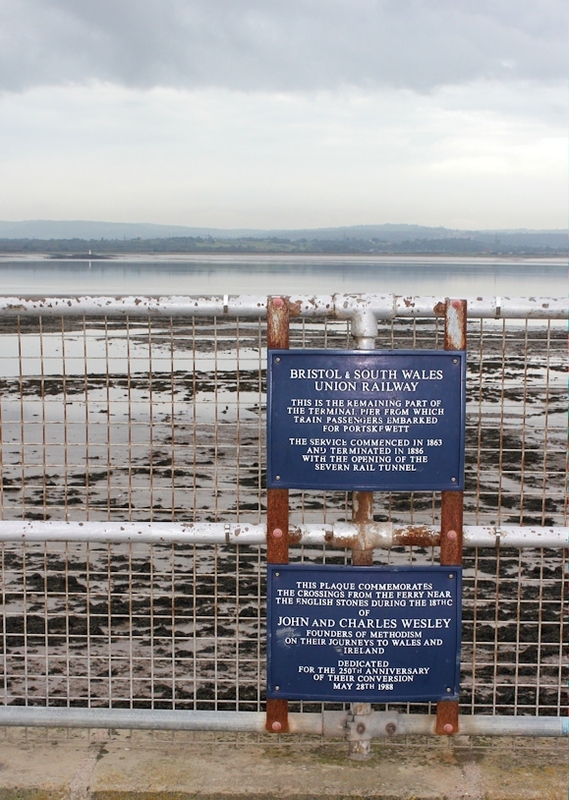 This is Beachley Point, a military area and part of Gloucestershire, still in England. I walk high above it, looking down at a bright green sports field, and then over a firing range. I leave Beachley behind and begin crossing water again. 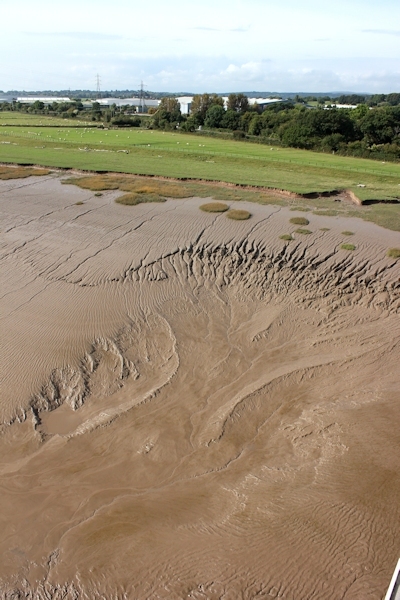 The tide is still low and I get a stunning view of the muddy bank on the other side, carved with patterns. The small dots on the green grass are sheep. They look so small from up here. I wonder what I am looking at. Am I in Wales yet? My OS Explorer (number 154) only covers the English side of the bridge and I discover I have stepped off the map! Yikes. I feel a giddy jolt of disorientation. But then I remember I have brought along an A4 piece of paper printed with a map downloaded from the wonderful Wales Coast Path site. Time to pull this out now. The water I’ve just passed over is the mouth of the River Wye, marking the border between England and Wales. Yes, I’ve reached Wales! And a short time later I come to the end of the bridge. Definitely Wales: the road signs are printed in two languages. I walk through the gate, off the bridge. It was 12:13 pm when I stepped onto the bridge, and exactly 12:58 pm when I step off it. It’s taken me 45 minutes to cross the 2.5 miles. Not bad going, considering how many times I stopped to admire the view and take photographs. Now I follow the footpath as it lead me down away from the motorway. Next stop is Chepstow and lunch. This entry was posted in 11 Somerset and tagged hiking, photography, river, travel, walking. Bookmark the permalink. Yay! Well done Ruth. Bet you’re looking forward to the Wales Coast Path (particularly Pembrokeshire). We’ve just got back after re-walking a number of sections in the reverse direction. It never fails to impress. Well done. Good to see you in Wales. It was just like going over that bridge all over again. 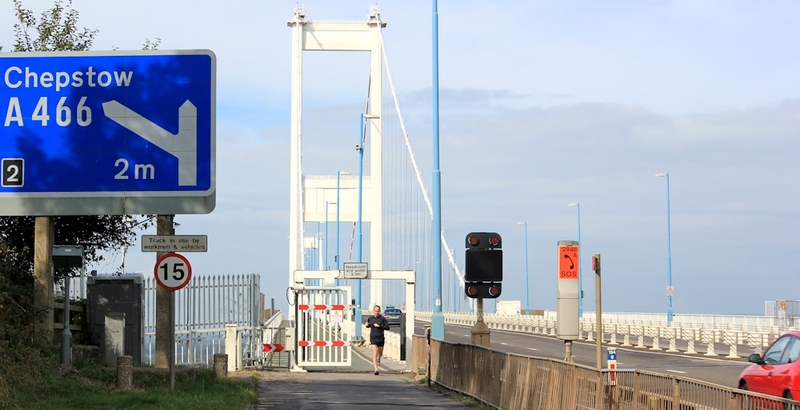 Last summer I crossed my LEJOG route at the Severn Bridge when walking the Severn Way north to south. Approaching the bridge it looked as though there was a way underneath via a concrete abutment and railings. I should have known better, but once embarked I was reluctant to go back. 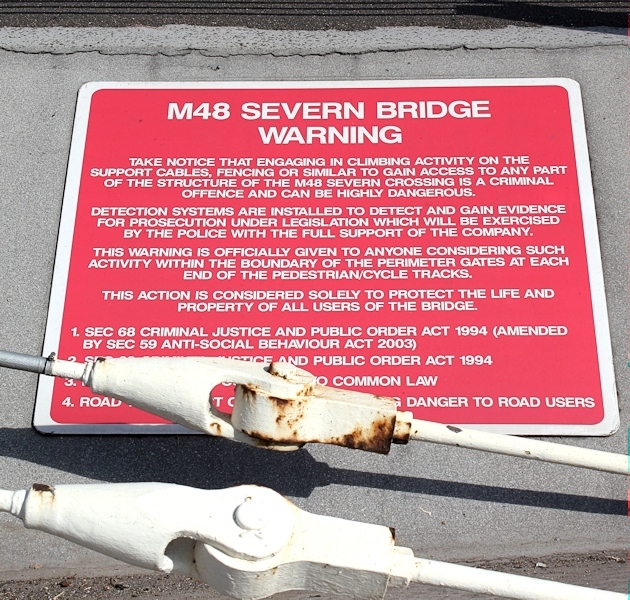 At the M48 Severn Bridge I could not see signs for the Severn Way and assumed the path went underneath, although later inspection of the map shows the route I couldn’t find. I was faced with a scramble up red clay banking to gain a concrete abutment with galvanised tubular railings and a zig-zag metal and concrete staircase with an interesting traverse near the top. There were “do not enter” notices, and some of the fencing was over eight feet high, but I found my way round. This was most entertaining, my very own via-ferrata, or via-galvanica? As I clambered over the last forbidden, locked gate there was a small maintenance service van parked in the service road, and I thought they were waiting for me. They had not been alerted, but realised what I had done and expressed disapproval, but became quite pally after a bit of chat giving me info about my route ahead; one of them had done The Coast to Coast (W’s I think, not Pacific to Atlantic). I nearly went under the bridge too! It looked very tempting. Luckily I asked that man the way and he pointed me in the right direction. Hello Ruth- we are planning to do the walk across the old Severn Bridge tomorrow staring off in Tenby Lane, Thornwell. Is it easy to find the way onto the pedestrian path? I’m worried we are going to get lost underneath! Ooh, good question. I don’t know, because I did it the other way round, but I THINK the footpath was signposted to the bridge. It’s certainly well worth doing the walk, although I would pick a day that’s not too windy. Thank you Ruth! We will stumble around and hopefully find it! PS – click on first picture to see as slideshow. ps – if I were your hubby I would have driven over to that row of parked cars, pretended to be asleep and waited for your reaction as you walked passed! Many years ago, when we were teenagers, we walked across the Old (then the only) Severn Bridge with Mum & Dad. Then Dad walked back across, got the car and came to collect us. Think we went on to visit relatives in Gwent. Did you enjoy walking across it, as a teenager? I hated walking anywhere when I was younger and found family walks a real trial. Different perspective now. Hi Gemma. Walking between two sets of traffic seems very unpleasant. And you can’t have had very good views. What a shame. Hope your walking goes well in the spring. I’m looking forward to longer days already. Congratulations on making it across the border, Ruth! I’d no idea you couldn’t walk across the Second Severn Crossing – makes me relieved I’ve not yet tried! I walked past those very same cows (well, the same field) a year ago and they were as docile. Further along, I got very lost (and wet) but I followed another path that suddenly brings you out beside the M4 but more inland – that was very surreal indeed. Looking forward to seeing your walks around Wales. Hi Olly. 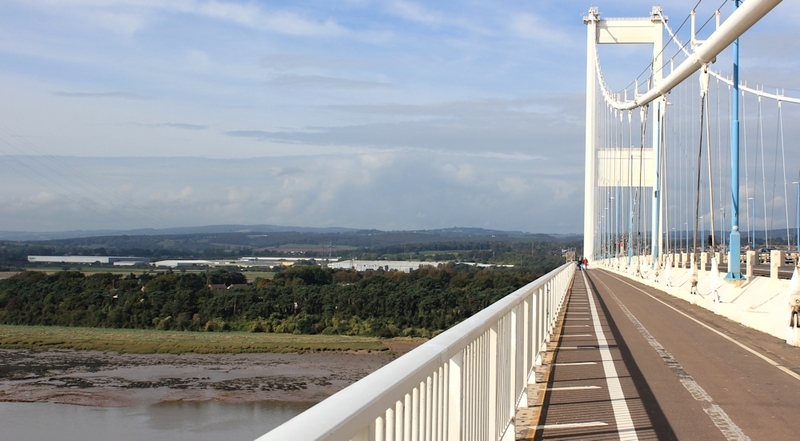 It’s a shame they didn’t create a cycle/walkway across the Second Severn Crossing. Don’t you think it would make a fantastic circular walk: across one bridge, along the river, and back over the next bridge? A missed opportunity really. I’ve crossed the Severn on that bridge many, many times but always in a car or on a motorbike. What a wonderful walk. Bridges always have amazing views and I’m glad the weather brightened. Your photos of the new. Ridge are beautiful. Severn beach is really nice ..quite a surprise.. As was the bird migration area just north of it..the walk of the Severn bridge is delightful.. Although a little disconcerting when it all shakes as Lorries go by..thank you for letting us know that you can walk it…really lovely walk. The views, and your photos of them, are wonderful. What a milestone to be in Wales.